I haven’t bought any glittery roses for the purpose of personal decoration since I was about 14, but I still have a soft spot and a large drawer for all that cheap glittery stuff I bought from Claire’s Accessories as a kid. Anyway if glittery jewels plus audio technology makes you feel hot waves of gadget lust – the Jewellry earphones from gadget4all will probably please you. 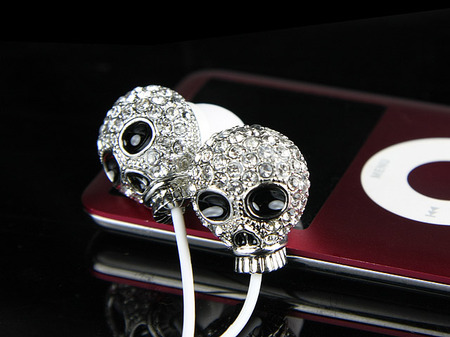 Designed to appeal to 13 year old girls and I guess anyone who still feels like one on the inside, there’s a Jewel Rose Earphone for the pretties and Jewel Skull earphones for the alternative gothy ones. What’s the audio like? We imagine that’s not the priority. 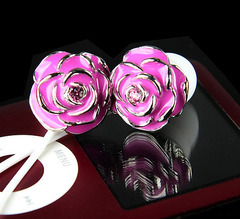 The 3.5mm stereo earphones weigh 30g and are 90cm in length.